One in every eight women is diagnosed with breast cancer. Join the sisters of Zeta Tau Alpha in our 24th annual 5K to raise funds for the UVa Breast Care Center and the Zeta Tau Alpha Foundation. All proceeds will go towards the advancement of breast cancer research, education, screening and treatment. "This event still means the world to me, and I'm not going to let this illness make it take a back seat." The Run for Life 5K has truly become a “town meets university” event with people of all ages coming out to run or walk in honor, or memory, of friends and family who have been diagnosed with breast cancer. With an average of 1,000 participants every year, we are able to bring the UVa community, as well as the Charlottesville community together to fight for a cause that is near and dear to our hearts. Join us in fighting the disease that affects 1 in 8 women. 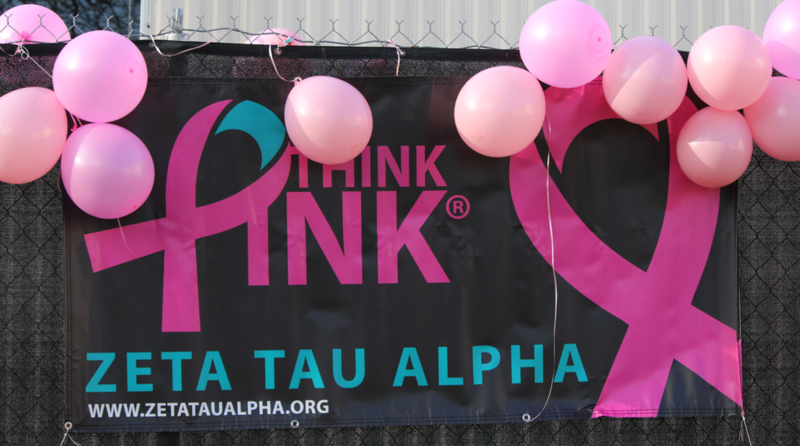 By advancing research, education, screening, and treatment, the ZTA Foundation works towards its mission to eradicate breast cancer as a life-threatening disease. Last year, we raised nearly $30,000. 60% of the funds raised were donated to the UVa Breast Care Center to help those affected in our community. Your participation is instrumental in both the continued success of this event and the fight against breast cancer. To support us as a corporate sponsor, please email: lda5mr@virginia.edu.